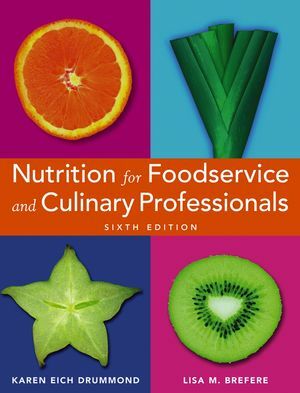 Nutrition for Foodservice and Culinary Professionals is the must-have reference for the most thorough, up-to-date information on nutrition and diet. New and expanded material in this Sixth Edition addresses important topics such as the 2005 Dietary Guidelines for Americans, MyPyramid, balanced menu options and recipe ideas for morning and afternoon breaks, basic principles of food presentation, meeting special dietary needs, weight management, and much more! Karen Eich Drummond has authored and coauthored numerous books, including Supervision in the Hospitality Industry, Third Edition and The Restaurant Training Manual, both from Wiley. Lisa M. Brefere is a Certified Executive Chef, a member of the American Culinary Federation and the American Academy of Chefs, and a graduate of The Culinary Institute of America with over twenty-two years of experience in the field. PART ONE. FUNDAMENTALS OF NUTRITION AND FOODS. Chapter 1. Introduction to Nutrition. Food Industry and the Media. Characteristics of a Nutritious Diet. Nutrient Recommendations: Dietary Reference Intakes. What Happens When You Eat. Chapter 2. Using Dietary Recommendations, Food Guides, and Food Labels to Plan Menus. Dietary Recommendations and Food Guides. Dietary Guidelines for Americans (2005). Food Facts: Nutrient Analysis of Recipes. Digestion, Absorption, and Metabolism of Carbohydrates. Ingredient Focus: High Fiber Grains and Legumes. Food Facts: The Facts About Low-Carb Foods. Hot Topic: Artificial and Reduced-Kcalorie Sweeteners. Chapter 4. Lipids: Fats and Oils. Food Facts: Oils and Margarines. Ingredient Focus: High Protein Meat, Poultry, and Fish. Ingredient Focus: Fruits and Vegetables. Food Facts: How to Retain Vitamins and Minerals From Purchasing to Serving . Hot Topic: Functional Foods and Phytochemicals. Chapter 7. Water and Minerals. Ingredient Focus: Nuts and Seeds. PART TWO. DEVELOPING AND MARKETING HEALTHY RECIPES AND MENUS. Chapter 8. Foundations of Balanced Cooking. Sauce Alternatives: Vegetable Purées, Coulis, Salsas, Relishes, Chutneys, Compotes, and Mojos. Cooking Methods and Techniques for a Balanced Eating Style. Chapter 9. Balanced Menus and Recipes. Chapter 10. Marketing to Health-Conscious Guests. Gauging Guests' Needs and Wants. Responding to Special Guest Requests. Low in Added Sugars . Low Fat, Saturated Fat, and Cholesterol. Developing and Implementing Balanced Menu Options. Restaurants and Nutrition Labeling Laws. Part Two Nutrition's Relationship to Health and Life Span. Chapter 11. Nutrition and Health. Menu Planning for Cardiovascular Diseases. Menu Planning to Lower Cancer Risk. Nutritional Adequacy for Vegetarian Diets. Chapter 12. Weight Management and Exercise. "How Much Should I Weigh?". Eating Plan and Nutrition Education. Menu-Planning for Weight Loss and Maintenance. Chapter 13. Nutrition Over the Life Cycle. Nutrition and Menu Planning During Lactation. Infancy: The First Year of Life. Menu Planning for Older Adults. Food Facts: Creative Puréed Foods. Appendix A. Nutritive Value of Foods. Appendix B. Dietary Reference Intakes. Appendix D. Answers to Check-Out Quizzes. This bestselling text offers a comprehensive treatment of the subject for today's foodservice and culinary professionals.